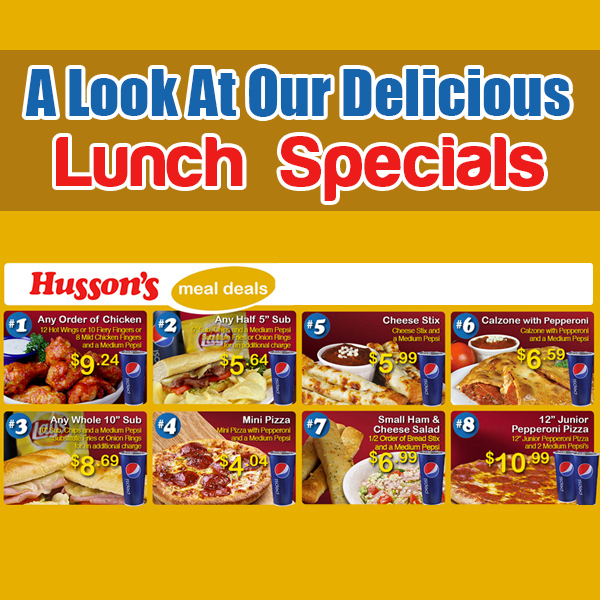 Hi Nick Husson here, and I'm excited to discuss some of the latest and greatest meal deals offered to you at Husson's Pizza. We are the area's most trusted and beloved local pizza restaurant, partially because of our delicious special recipes and also because we love to offer you great deals on all your meals. That's why I'm going to drop a line to remind you of some of our best lunch specials. These are perfect for a midday meal and offer prices that are hard to top. Order any five-inch sub and receive chips, and a medium Pepsi for only $5.64! If you are interested in our delicious fries or famous onion rings, feel free to ask! Personally, I love a turkey sub tomatoes, cucumbers, and mustard paired with a Mountain Dew and onion rings. Upgrade our five-inch sub to a massive 10-incher with chips and a medium Pepsi, all for the low price of $8.69. That's a savings of over three dollars! If you don't have the time or stomach to eat a whole pizza, try our mini pizza deal. For just $4.04, you can get a mini pizza with pepperoni and a medium Pepsi. This is a great "pick-up-and-go" meal deal for when you want pizza, but can't find anyone who wants to split one with you. Upgrade to a 12-inch junior pepperoni and two medium Pepsi for just $10.99. Don't forget about our $5.99 cheese stix with a medium Pepsi or our calzone with pepperoni and a medium Pepsi for just $6.59. Whatever meal you think sounds the most mouth-watering, don't forget to call us ahead of time to make sure your order is ready before picking it up. Hope to see you soon!